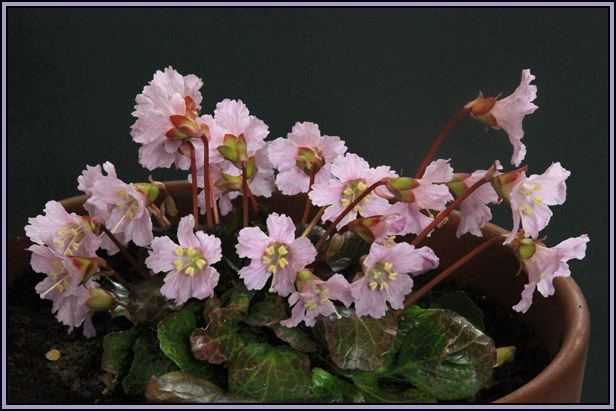 Shortia uniflora, also known as ‘Nippon Bells’- is a woodland plant which comes from the Japanese island of Honshu. 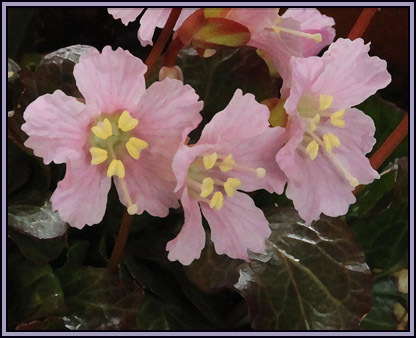 Shortias are named after Dr Charles Wilkins Short (1794-1863), a Kentucky physician and botanist.There are about five species, occurring in the Appalachians in North America, and in Japan. 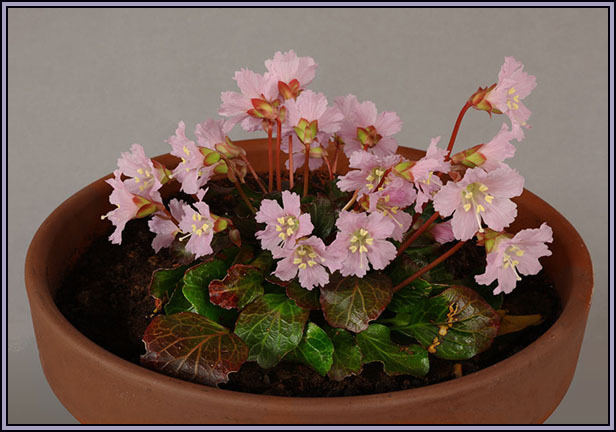 S. uniflora is an unusual perennial plant, low-growing to 15cm, and likes damp shade. Flower colour is usually pink. I bought the plant probably in November 2016 in a small pot. I repotted it into a 4 inch square pot in summer 2017 and fed it tomato fertiliser a couple of times. It was put behind a 12 inch high pillar on a gravel path facing west, hedge and north. Given very little attention. Near the end of March this year I noticed flower buds and decided to bring it to the Ulster Show. It needed a clay pot, and the only one I had was 25cm diameter. I half filled this new pot with compost and some grit and pushed in the pot to make the impression. Having loosened the plant, I slid it onto a plate and from the plate into the hole. Added extra compost and firmed it up. Only on the Friday I realised that it was in a pot too big for the novice section and put it in intermediate. I was more than delighted when it received first prize in class and also best plant in the intermediate section and Betty Hill trophy.